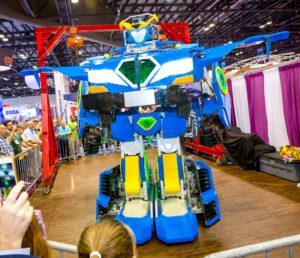 A Sansei company, Asratec, and Brave Robotics introduced the prototype of a ridable transforming humanoid robot, “J-deite Ride,” at the recent IAAPA Attractions Expo. J-deite Ride is a 4-metre (13 foot) tall robot that can transform from a bipedal walking humanoid form (robot mode) to a wheel-driven form (vehicle mode) and back. Up to two people can ride the robot. It is operable from the driver’s seat. It can also be operated by remote-control via a wireless network. Brave Robotics designed and developed the hardware, including the unique transforming mechanism, and Asratec’s robot control system “V-Sido” performs the robot motions such as the transformation, bipedal walking, wheel driving and more. Sansei is hoping to develop and commercialise transforming robot type amusement rides for amusement parks, such as “transforming go-karts” or “transforming demonstrations at parades”, with use of the transforming technology of J-deite Ride. They are recruiting sponsors for J-deite Ride. Sponsors will be able to use J-deite Ride for exhibitions, promotions, event performances and more.